First, let's get to the basics. The Safety Baby Electric Breast Pump weighs 2.1 pounds. The dimensions are 10.3 X 9 X 4 inches. It is made from BPA Free materials. It is electric and batteries are not required. For cleaning, do not immerse this pump in water. Instead wipe clean with a damp cloth. This is a single use item and must be properly sterilized between uses. If more than one person uses this pump without sterilization, it could pose a serious health threat for your baby. It also voids the warranty. "Very strong and empties my breasts faster than any other expensive brands. Very easy charge. Only 2 pieces to clean!! Can’t explain enough how much I love this pump." For an electric pump the price is low, but it is also a very simple pump so there are not a lot of extra features. Considering what you are getting, the price in my opinion is fair. Some breast pumps can not only be uncomfortable, but they can be downright painful according to women who have used them. This pump is not one of those painful kinds. The reviews reflected that women felt comfortable using it. "This is my third time breastfeeding. I have used four different pumps all together. I am extremely pleased with this SafteyBaby pump. Great suction without being painful. Extremely comfortable and easy to hold as well. I have a circulatory disease called Raynaud's which gives me unique obstacles to overcome when breastfeeding. I need a pump with good but gentle suction. This definitely gives me that! One of my favorite parts is the suction cup, it has a gel like piece that you can remove if you don't like it, I happened to love it. The gel acts like a cushion and helps to massage the breast . I also like the disc that connects to the bottom of the bottle (you can look in my picture) . The disc makes it easier to hold on my leg. Less problems equals easier life!" I could not find much information on how much this pump will hold as far as ounces. It seems as if it could fit on most standard bottles that screw on. It doesn't seem to come with any kind of storage bag for transporting the pump. But it is a small pump, so it should fit in a purse or diaper bag. "Awesome portable pump!!! Super easy to use. Couldn’t be easier and has great suction! I had a medela pump in style years ago. It was fine. This is such a low price and totally effective. I like it better than the fancier pump I had. I don’t pump much, so I’m not sure it’s great for daily regular pumping. For here and there, it’s excellent for me. Would definitely buy again." "This pump worked well on a long car trip when it wasn't always easy to find a rest stop to nurse and you absolutely need to drain milk before you get plugged ducts. So much easier than connecting all the tubes and parts. And, you can charge it in the car with the car adapter you use to charge your phone. I have a separate double electric pump I received through insurance that I use to pump while at work. But for travel, this pump was well worth it for the convenience." 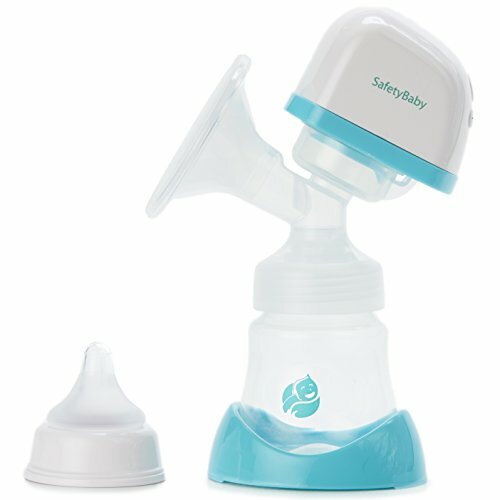 If you are looking for a simple and inexpensive pump than you might want to give the Safety Baby Electric Breast Pump a try. It does not have a lot of extra features, but it should get the job done. It would be good for travel if you don't want to hull around a big pump. I hope that this review helps you as you look to purchase the best breast pump for you.